Celebrate U-pick apple season in Orange County, N.Y.
Orange County, N.Y. – Autumn is the perfect time to take advantage of the colorful landscape and outdoor activities in Orange County, home to some of the best apples in New York State. The orchards offer a wide variety of weekend activities perfect for family outings. Pumpkin patches, tractor and pony rides, corn and hay mazes, and even a little hard cider tasting, round out days of fun in the crisp Hudson Valley air. Sample more than 50 varieties of apples ripening on the trees from late August through October. Find more orchards and fall farm fun on the Orange County Tourism website Agritourism pages and online calendar of events. 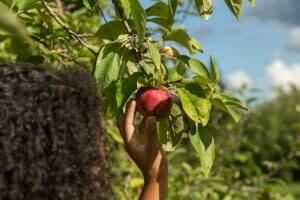 Groups should call ahead to make special arrangements for their apple picking outings. A trip to Orange County, N.Y. isn’t complete without an overnight stay at a cozy B&B or select hotel. Visit www.OrangeTourism.org for a full list of lodging, activities, and attractions. Orange County Tourism’s Facebook page: Orange County Tourism NY is a fabulous guide to up-to-the-minute postings of area events and activities, great times, and memorable experiences available to visitors. Orange County Tourism, based in Goshen, N.Y., is the county’s tourism headquarters and a participant in the I LOVE NY program. A comprehensive listing of area attractions, lodging, and events can be found at www.OrangeTourism.org. For a free copy of the Orange County Travel Guide, e-mail tourism@orangecountygov.com or call 845-615-3860. Photo features: Apple Dave’s Orchard, Warwick, N.Y.